If you're looking for a place to inspire children's imaginations while you CALM THEM DOWN :>) a garden of the five senses may be just the ticket. "Interactivity" is the name of the game in kids' gardens. But there's more to a Five Senses Garden than a simple educational project. There's just something so peaceful and beautiful about slowing down long enough to take in the gentle stimuli of a garden, especially one designed to delight your five senses. Teachers are amazed at how children calm down physically and activate their thinking when they are engaged by nature and their five senses. You don't need much space, but it is really nice to have a place with a little sunlight and a little shade. You hopefully will have at least one tree with rough, touchable bark. If you are blessed enough to have a stream, pond or some kind of running water, your five senses garden will be extra intriguing. To get things going, simply assemble one plant from each category, with a label for each one. You can always add more - and you will! You could use a large craft stick and write on it with permanent marker the name of the plant, and which sense it engages. For younger children, you could draw a picture of an ear or an eye, for example, to show which of their senses they can interact with this plant. Lamb's ears . . . for touch. 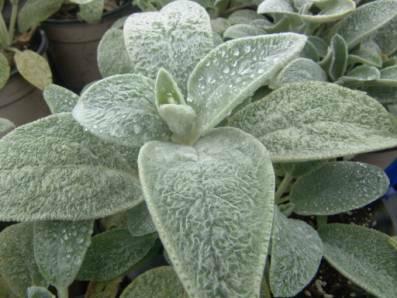 Lamb's ears - very soft, gray leaves - also called "donkey's ears" - spikes of pink flowers in June; cut them off after blooming; easily dug up and divided to make a larger patch in the fall. Cactus - plant a cactus houseplant such as bunny ears cactus outside for the summer right next to the soft lamb's ears for the amazing contrast in textures - be sure to pot it up and bring it inside in the fall in cold climates. Hostas - these shade-loving beauties often have a crinkly texture that is amazing for small hands to feel. Moss - a tiny "cushion" of Irish moss is a delight to bare feet, or makes a charming seat when grown on a thin layer of soil on top of a section of log. Smooth stones - you can form a gently curving dry streambed of river rock that children love to pick up and feel, and don't neglect a natural-stone stepping stone path out of flagstone or other beautiful and interesting naturally-shaped stone. Strawberries - is there a plant more suited for children to love? You can find a variety that should bear you two crops in June; add compost in fall and early spring for bigger berries. Mint - catmint and spearmint leaves taste marvelous; did you know that in colonial America, they often had a stand of mint next to the church door for people to grab a leaf or two to chew on during the looooooong church services of those days? Stevia - this interesting herb flowers beautifully but its leaves are amazingly sweet to nibble on, and dried, it makes a great natural sweetener. Chives - garlic chives or onion chives can be snipped off with a fingernail on the spot, or snipped into "loaded potatoes" or scrambled eggs for a healthy and tasty snack. 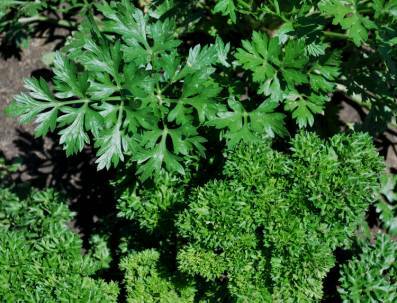 Parsley . . . nature' breath freshener. Parsley - after you've eaten some chives, you'll want to follow up with a few sprigs of parsley - nature's breath "mint" with an herbal taste that's not like anything else. Korean lilac bush - this is a good choice for a miniature version of lilacs if you're short on space and a traditional lilac, which may top 10 feet, is too big; in May, the scent of lilacs is absolutely intoxicating! Lily of the valley - this sweet, short ground cover produces a spike of tiny white bell-shaped flowers in early May that are the more delicate and memorable than the finest perfume. Usually, you'll want to grow at least 10 or 20 together; cut off the flower spike when it fades in two weeks or so; most of the year, they're just green, but they're pretty. Lavender . . . the favorite scent of many people. 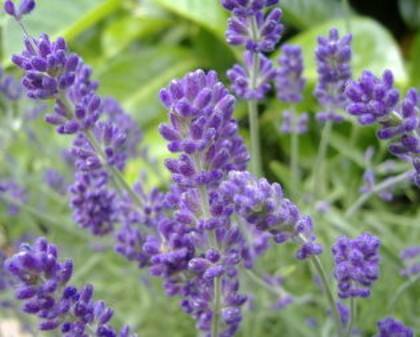 Lavender - children love to cut a few sprigs of lavender to give their grandmothers or make sachets out of this sweet-smelling herb's flowers; in the olden days, women put lavender in their bedsheets in the wintertime when it was too cold to wash sheets and dry on the line outside. Munstead's is a good variety of lavender that's easily grown, but be sure to water daily when it's newly planted for a week or two. Honeysuckle - another intoxicating scent, but beware of the bees that this sweet-smeller attracts. Sage - the purple or Russian variety has a slightly spicy, delightful scent, and the light purple flowers are very nice. Scented geranium - they are hybridizing all kinds of amazing scents in this most beloved of American annuals - lemon, peppermint, chocolate - you name it. Fun! Oriental lilies - these tall, mid-summer giants can perfume an entire yard or playground. They grow out of a large bulb that should be planted in the fall or early spring. Trumpet Vine - if you have space for this spectacular vine with its orange, trumpet-shaped flowers - keeping in mind that it can climb as high as 20 feet up a telephone pole or tall fence - then get ready for the incomparable sound (and sight) of hummingbird wings! If you don't have much space, you can usually attract hummers or the rapidly-beating wings of gypsy moths with bright red petunias. Ribbon Grass - a nice stand of this striped grass makes a lovely whooshing sound in the wind. Actually, any grass will do that - prairie grasses such as switchgrass and big bluestem are good choices. this plant is nowhere near as scary as the real thing. 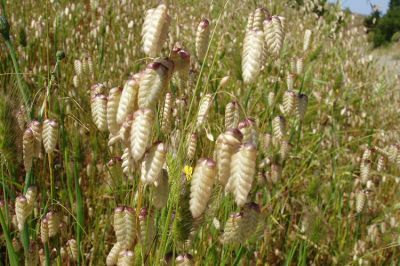 Rattlesnake Grass - has pods which rattle in the wind. Many other plants have pods that bear seeds and rattle, too, but usually after they have dried out over the winter. Ask at a garden store for this specialty grass, or look online for a source from which to buy. Love in the Mist - this wildflower has rattling seedheads that are fun for children to listen to. Wind chimes - they are a lovely addition to any garden, and direct children's attention to the all-important factor of the wind. Water feature - if you can arrange some kind of gently dripping or running water, including a fountain or a recirculating stream in your garden, you will increase the peace factor as well as the interest 1,000 percent. Gladioli - they may be the showiest flowers of all, but you have to plant bulbs every two weeks for about six weeks in the spring in order to have a constant show of color. Zinnia - especially because these perky, sun-loving flowers attract butterflies and come in a riot of colors, they will be an attractive sight all summer long. Bleeding Heart - children are fascinated by the multi-part, heart-shaped flowers in late April and early May. Balloonflower - the way the buds fill up like a balloon, and then "pop" into a bell-shaped flower, is delightful. They come in pink, blue and purple flowers. Red Hot Poker . . . a charming sight; native of South Africa. 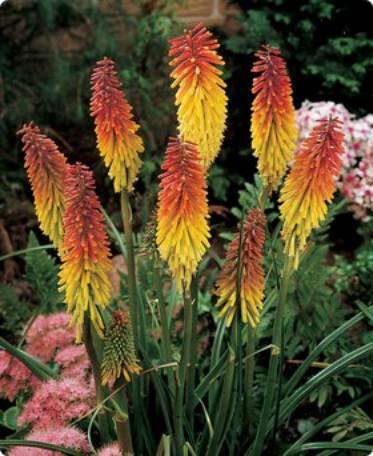 Red Hot Poker - this may be the funniest-looking flower, and it really does look like it's on fire. It's tall, for the back of the garden. Chinese Lantern - a childhood favorite, this rather modest-looking green plant grows an adorable little mini-pumpkin type pod in the late summer and fall that really does look like an orange lantern and can be cut for an autumn dried arrangement.